Sometimes, we are learning a new game or we just don’t have anyone to play with. Sure, it may be easier to play a game on an iPad, but often times it’s just nice to sit back and relax with our favorite beverage and relish in the cardboard on the table — to disconnect from our electronic lives. In this on-going series I hope to highlight some games that play well solo. These could be co-op games, multi-player games with solo variants, or games specifically designed for one player. Uwe Rosenberg has long been known as a heavy Euro game designer. Often his games are big, sprawling, table eaters with tons of cardboard tiles, wooden resources, and, if you’re lucky, animeeples! In 2012, Z-Man Games released Glass Road — a game designed for 2-4 players. 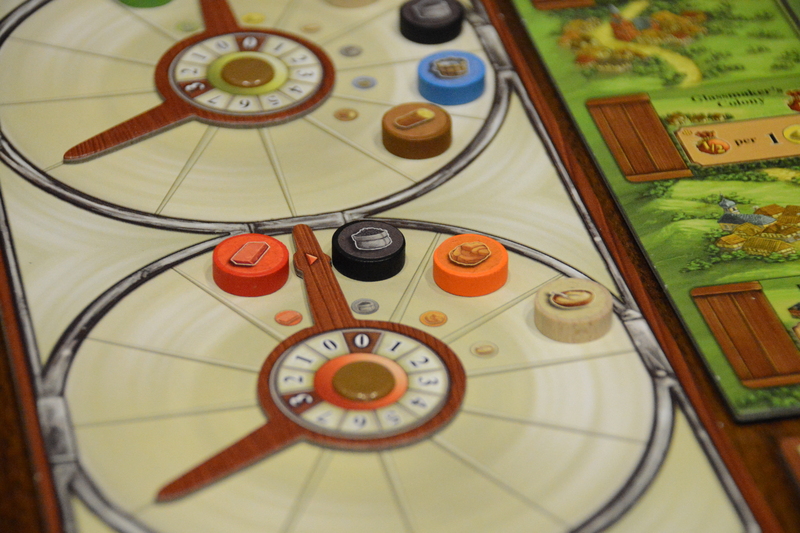 Although it shines with three players, it plays remarkably well solo. 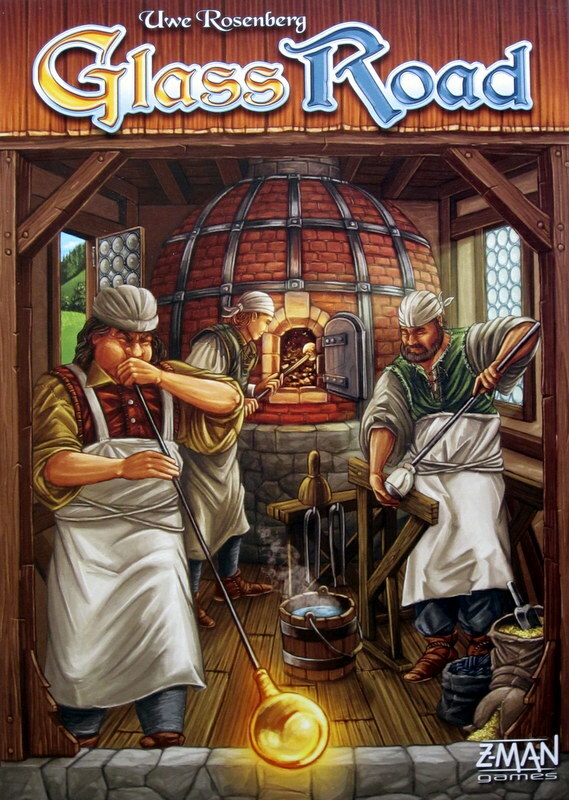 In Glass Road, you are trying to maximize the production of glass and brick by managing the component resources much like the artisans of the seven century-old Bavarian institution of glassmaking. You are trying to gain as many victory points as you can by purchasing various buildings from a randomized field of nine. 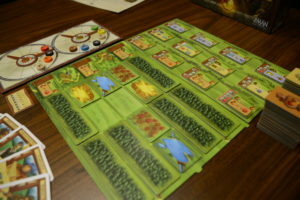 You also have a player board that consists of various tiles that represent glades, sand pits, ponds and forests. On this player board you may remove certain tiles for resources. You can also gain resources from card play based on what tiles are on your player board. You’ll use those resources to purchase buildings. Some buildings give you on-going abilities that you can perform anytime such as converting one type of resource to another or more. Other buildings, once placed on your player board, give you a one time, immediate benefit while the last set of buildings allow for end game bonus points. The heart of the game are the production wheels. One for glass and the other for brick. – two of the main building resources and point generators. On the glass wheel you manage and utilize sand, water, charcoal, wood and food to create glass while on the brick wheel you track of charcoal, clay and food to make brick. The wheels are a clever design. 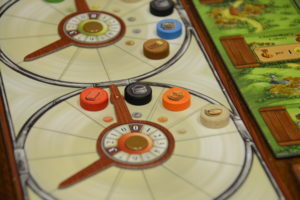 As you gain resources and move wooden tokens representing different resources clockwise around the wheel, you create an empty slot and the wheel must turn to create one (or more, up to three) glass or brick which in turn makes the count on other resources go down. (see photo) It sounds confusing – it isn’t. It’s genius. It avoids having a pile of multiple resource bits in front of you to set up, count, manage, convert, turn in, and put away. Each round you will choose a certain number of cards from a pool of 15. (3,4,5,6,3,4,5) This makes a total of seven rounds. Each turn’s cards you have chosen are not available in the subsequent round but are in the round after that. Each chosen card is drawn randomly and you perform one of the two abilities printed on the card. When you are down to two cards in a round, pick one card, do both actions and discard the other. Cards allow you, for example, to perhaps build sand pits (to gain sand or clay), clear cut forests for wood or food, get food or water for the number of ponds you have, or build buildings from the general supply. The interesting, addictive, and challenging part of the game is in the interaction of buildings, cards you play and the resources you have. Constructing buildings uses resources that you might be trying to save for some other building. Resources are tough to come by and managing them can often times all be a question of which actions you do in what order and this is made a little more difficult by the randomness of the card draw in your chosen cards for that round. As you reach the end of the game, because it’s a set number of rounds (and you know it’s coming), you’ll have to start crunching on what is the best way to optimize the cards you have left, the resources on each wheel, and how to gain as many points as possible. There are no point goals or levels of victory. Each game is a matter of beating your best score. Even with all this thinking and crunching (which really isn’t hard once you get the hang of it), the game plays really fast – about 20 minutes or so. Once you finish a game, you’ll want to play another – you’ll want to play it over and over. Glass Road is not as heavy as other Rosenberg games like Ora et Labora or Fields of Arle, but it is challenging, fun, easy to understand, and due to the number of buildings and the randomness as to what comes out, has a lot of replayability. This entry was posted in Game Review. Bookmark the permalink.